Instabind™ Faux leather style carpet binding mimics standard or traditional binding but without showing any stitching. It is new to Bond Products line as of 2018. 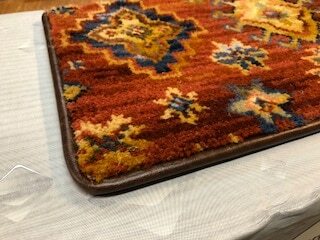 Available in 14 stock colors, it’s more durable than traditional carpet binding and actually helps reinforce the carpet backing along the cut edges. Best of all the only tools needed to apply are carpet scissors and a hot glue gun. We recommend that you use latex-based hot melt glue sticks for a long-lasting strong hold, be sure to glue where the stitching is on the Instabind. You can purchase Instabind in standard 48 foot (priced by the roll) or custom size lengths with an up-charge. Please note the diameter is estimated to be 5/16″. Note: The faux leather is great for high-end rugs at an amazing price!